Asians took to Twitter Tuesday to decry what they said was Hollywood's practice of replacing Asian characters with white actors. About 60,000 tweets answered the launch of the hashtage #WhitewashedOUT, started by comedian and actress Margaret Cho, writer Ellen Oh, and The Nerds of Color. "We want Hollywood studios, producers, and casting directors to stop casting white people in Asian roles — or any roles that should be filled by people of color," they said in a blog post. There's Tilda Swinton and the film "Doctor Strange," which will be released in November 2016. The Oscar winning British actress plays a character known as the Ancient One, who was a Tibetan male in the original Marvel comic. 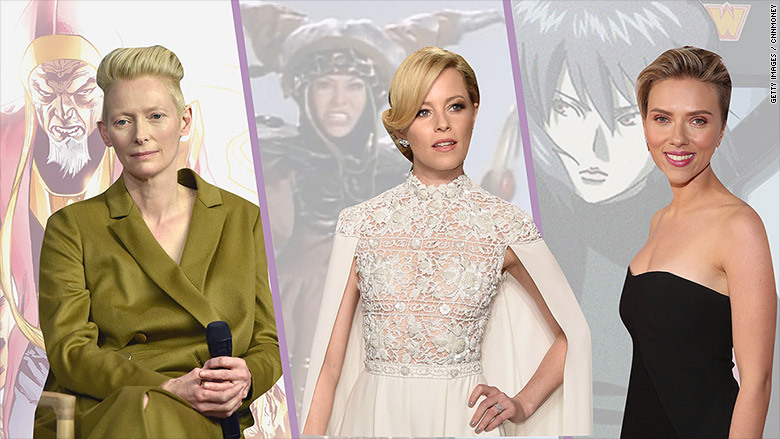 Elizabeth Banks was chosen to play Rita Repulsa in the Power Rangers movie, out in 2017. (Repulsa was an Asian character in the 1990s TV show.) And Scarlett Johansson was cast to play in a Hollywood rendition of "Ghost in the Shell," which was originally a Japanese graphic novel. It's due out in 2017. They launched the hashtag movement on Tuesday afternoon in honor of Asian Pacific American Heritage Month. About 60,000 tweets have rolled in by 7 p.m. with people sharing their thoughts on the "erasure" of Asian Americans from so-called "whitewashed" movies and how that trickles down to culture at large. "We're tired of Hollywood acting as though Asian Americans don't exist, and want to let them know that we aren't watching these whitewashed movies," they wrote in a blog post announcing the hashtag movement. What emerged is a powerful look at the impact of people growing up with primarily white characters in the media. Others shared examples of excuses given by those in the business. The recent examples aren't flukes -- it's a trend that dates back decades. 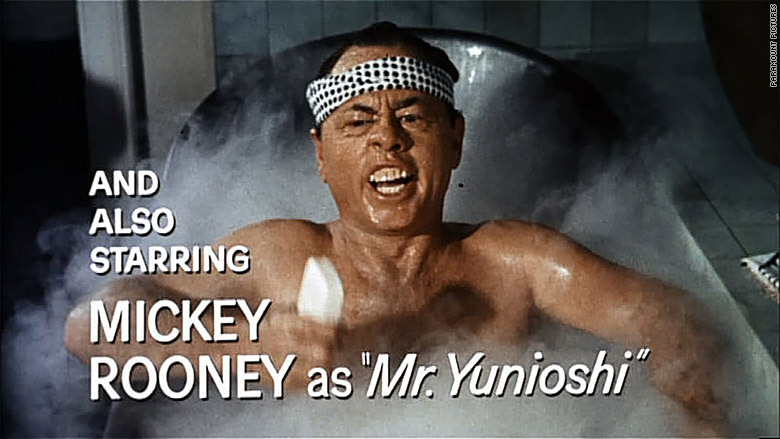 Remember Holly Golightly's Japanese neighbor, Mr. Yunioshi, played by Mickey Rooney in the 1961 "Breakfast at Tiffany's" film? The conversation around race extends to skin tone, as well. The casting of Zoe Saldana to play Nina Simone, a lighter skinned Afro-Latina actress was the subject of much scrutiny. Earlier this year, the Academy of Motion Picture Arts and Sciences said it hoped to double the number of diverse members of the Academy by 2020. The news came after outrage over the fact that for the second straight year, no people of color were nominated in major acting categories. A study released in February found Hollywood to be a "straight white boys club" both on and off-the-screen. It found that not only are there too few African Americans and non-white actors playing more than token roles, there are also few LGBT characters in film.